not heard of Robin Hood. With his band of Merry Men he thrived on robbing the rich to give to the poor. of the brigand, all once lived in Nottingham. Or did they and Robin Hood? nearby Sherwood Forest to feel the Robin Hood experience. these tourists have got it all wrong. that's a few hundred kilometres away. of Nottingham… in Robin Hood's day there was a Sheriff of Yorkshire. 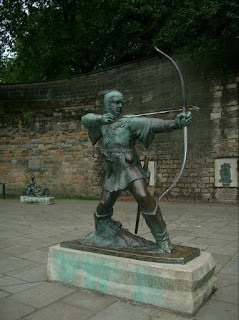 Robin Hood was around a venerable 70 years at the time he died. could get there, they'd find a fake gravestone anyway. wording in an attempt at 'authenticity'. of the pop music legends of the 1950s and 1960s. They seem quite incongruous in this tiny Yorkshire village. sewage works, the Batley Variety Club. this musical oasis in the grim north of England. Louis Armstrong's two-week gig in June 1968 put the club on the map. Neil Sedaka cemented its fame. 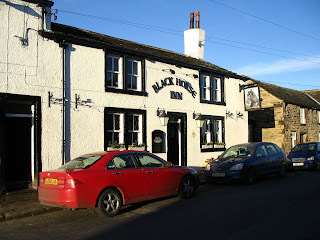 around that the Black Horse Inn at Clifton provided a better retreat. back every couple of years. Clifton in West Yorkshire still claim him as their's. visits for a pint today. BEST OF BRITISH - TRUE BLUE!